Why is America called bei? Previous: What is the origin of the name Godzilla? Next: What are the names of Japan? 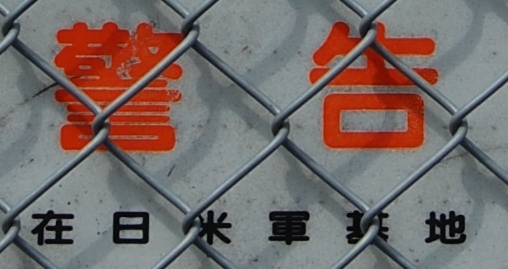 Sign: 在日米軍基地 "US Military Base in Japan"
The kanji 米 (Bei) used to mean "The United States of America" in words like beikoku (米国), "America", or beigun (米軍), "American military", is actually the kanji for 'rice'. Why is it used to mean "America"? This originates from writing Amerika (America) in kanji as 亜米利加. Here the 米 kanji is the second kanji in the word. This style of writing dates from an era in which kanji was used more frequently than now. Writing a non-Chinese derived word using phonetic kanji is called ateji (宛字). Why do some gairaigo words have kanji? has more on ateji applied to foreign words. The reason Japanese uses the "me" kanji (米) of Amerika rather than the 'a' one (亜) may be because Japanese uses 亜 as an abbreviation of Asia, from its kanji writing 亜細亜 (Ajia). Some other countries are similarly often written as a single kanji, especially in newspaper headlines and other abbreviated words. The names Igirisu for the United Kingdom and Yōroppa for Europe originate from Portuguese. See Which Japanese words come from Portuguese?